This is a page dedicated to the songs that remind us of Twilight! 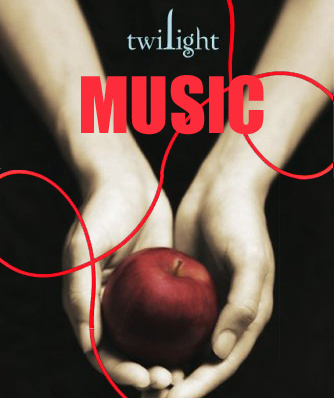 Also to see Stephenie Meyer’s playlist for Twilight, click here! I have 2 more tracks to add to the HUGE list! Hope that’s okay! i was listening to this song and i kind of thought of twilight right away! and today i was listening to Beautiful Disaster of Kelly Clarkson on the bus and when i realize that it was actually talking about a vampire, i looked by the window and i saw edward’s volvo though in black colour! and i thought alright , yes this is talking about a vampire! just crazy! and the song fits perfectly for me! Ooh ooh, hello me again. I have another song… by another Aussie 😛 haha. “Obsession (I love you)” by Amiel – she also sings “Lovesong” you all know her. Just let time slip away. The things id never do. …Just to name a few that I think would go well with New Moon. I have a few more, but I can’t think of them right now lol. Wow, The Best Thing By Relient K sounds like it was actually written about Edward and Bella’s relationship!!!!! Drive My Soul by Lights is PERFECT! IT’S SO PERFECT!!!! I always have this song playing on my Cd player when I read Twilight or New Moon or any of the Twilight novels! I have it on right now because I;m reading Eclipse for the TENTH TIME!!! EEEEEEEE!!!!!!! And SO many more but these are my favourites. OME, I’m Only Me When I’m With You by Taylor Swift (it’s already on the playlist) is, like, Bella and Edward’s anthem! Because Bella’s secrets ARE her fears, and half the time he’s driving her crazy, the other half she’s telling him how she feels. AND she acts differently around everyone else. And whenever Edward’s down or hwatever, she’s not happy. It’s the same way for Edward. PERFECT! sorry…i ave a lot…. XD but they are ALL really good songs and i loved them even before i realized how well they fit….anyways…enjoy!!! Paramore: Pressure.. The first time he sees her in Biology class. I guess my list would relate to all of the books but i left it in the Twilight section cause that is where it all started for me! heehee i know there is a lot but common thats 4 whole books smashed into one…i couldnt pick which book they each fell into so enjoy! I expect you to, so why haven’t you? “My Last Amen” – Downhere would be a great addition. it explains the change in Edwards’ life after coming of Bella in a rather wonderfully fantastic way!!!! I think that these songs ROCK! But…. personally I believe that you guys should add a song called “Bring Me to Life” by Evanescence. I think that the lyrics: How can you see into my eyes like open doors, really reminds me of Edward’s ability to read peoples minds, and Jasper’s ability to feel emotions. And the lyrics: Wake me up (I can’t wake up), and Save me from the nothing I’ve become, really remind me of Bella and how she was kinda an outcast in Arizona and how Forks, WA and Edward really bring out the real Bella who has been locked up inside of her soul and how after moving and having another life and meeting the right people has really made her a real person again. ‘ I Could Get Used To This’ by The Veroncias because it reminds me of the way Bella is always thinks she isn’t good enough for Edward. Log in | 52 queries. 1.054 seconds.